Durabolin is an anabolic steroid that was created by Organon in the late 1950’s and is officially known as Nandrolone Phenylpropionate. This anabolic steroid is almost identical to Organon’s Deca Durabolin (Nandrolone Decanoate), the only difference being the ester attached. This makes Durabolin or NPP as it’s commonly called a much faster acting version of Nandrolone. Durabolin is also one of the oldest Nandrolone compounds and was actually released a few years ahead of Deca Durabolin. However, it has been Deca Durabolin and the overall Nandrolone Decanoate mixture that has dominated the Nandrolone market place throughout history. While Organon still makes Durabolin and there are many other pharmacies and underground labs that make NPP, it is not as commonly available. However, in recent years it has seen its demand slightly increase due to performance enhancement use. Durabolin is one of the most beneficial anabolic steroids to ever hit the market. The benefits of this steroid can easily be seen in both therapeutic and performance based circles. In a medical setting, along with testosterone this is one of the most important anabolic steroids we have, and the advantages it can provide run extremely deep. Unfortunately, the full potential of this steroid has never been realized due to the tremendous amount of controversy that surrounds anabolic steroids, especially in the U.S. In fact, the U.S. is far behind many parts of the world when it comes to Nandrolone therapy. While tremendous for medicinal purposes, Durabolin is also a premier lean mass promoting anabolic steroid. There are very few anabolic steroids that can pack on quality mass along side a high threshold of toleration like Durabolin. It is also one of the best steroids for athletic enhancement due to the recovery and endurance enhancement it can provide. Durabolin is a 19-nortestosterone (19-nor) anabolic androgenic steroid. All Nandrolone compounds belong to the 19-nor class, as do all Trenbolone compounds. Trenbolone is actually a derivative of Nandrolone. The 19-nor classification itself notes a structural change in the testosterone hormone; specifically the removal or lacking of a carbon atom at the 19th position. This is what gives us the Nandrolone hormone. In the case of Durabolin, this same Nandrolone hormone is attached to the small Phenylpropionate ester, which regulates the release of the Nandrolone hormone. Phenylpropionate will provide a much sharper release of Nandrolone in Durabolin compared to the Decanoate ester in Deca Durabolin. The individual will have to administer Durabolin far more frequently than the larger ester based version, but it should still be within a comfortable time frame. Once injected, Durabolin will provide a sharp spike in Nandrolone within the first 24-48 hours and continue to slowly release the hormone until baseline levels are reached approximately one week later. Durabolin is a potent anabolic, slightly more anabolic than testosterone carrying an anabolic rating of 125 compared to testosterone’s 100. However, its androgenic nature is far less than testosterone carrying a rating of 37 compared to testosterone’s 100. This reduction in androgenicity can largely be attributed to Nandrolone’s ability to reduce to dihydronandrolone (DHN) rather than dihydrotestosterone (DHT) like testosterone. This reduced androgenic nature also makes Durabolin far more tolerable in supraphysiological doses for many men compared to high doses of testosterone. Both hormones should fall in the tolerable category, but the lessened androgenicity gives Nandrolone a slight advantage. This advantage can also be seen when examining its estrogenic activity. Durabolin, as with all Nandrolone hormones will aromatize, but only at 20% the rate of testosterone. It does, however, carry a strong progestin nature, and this will be important when examining the side effects of Durabolin. As you can see and will continue to see, NPP is truly interchangeable with Deca Durabolin, only the timing based on the ester is different. Durabolin carries with it many positive steroidal traits such as the ability to enhance protein synthesis, increase IGF-1 output and inhibit glucocorticoid hormones. 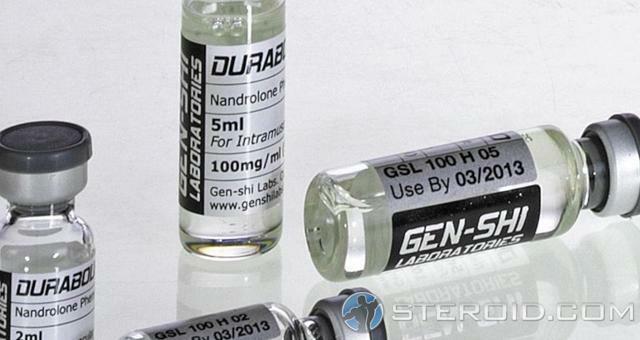 These are traits shared by many anabolic steroids, as is Durabolin’s ability to enhance nitrogen retention in the muscle, but the Nandrolone hormone has been shown to increase nitrogen levels more efficiently than many anabolic steroids. This will greatly promote the anabolic atmosphere in the body, and more importantly, protect the individual from a catabolic state. Durabolin will also greatly increase red blood cell count, in turn promoting more anabolic activity, muscular endurance and recovery traits. Like all Nandrolone hormones, Durabolin is well-known for carrying two traits that set the Nandrolone hormone apart from many anabolic steroids. Such traits will also represent the very reason many choose to supplement with NPP, especially in athletic circles. The use of Durabolin will greatly enhance and promote bone mineral content and collagen synthesis. This will provide tremendous relief to the joints, as well as remarkably improve the body’s recovery abilities. The issue of recovery is nowhere near as exciting sounding as massive increases in strength or size, but veteran athletes understand it is the most important issue when it comes to success. While Durabolin has proven useful for such treatments, Deca Durabolin or related Nandrolone Decanoate compounds is normally the Nandrolone prescribed. However, in the U.S. the use of Nandrolone has become extremely limited due to intense anabolic steroid legislation. The strict control has actually hindered numerous advancements and treatment plans, making it no surprise that Organon has left the U.S. market. However, many U.S. physicians are beginning to recognize the benefits of the Nandrolone hormone; basic therapeutic rejuvenation plans are being realized. In time, the U.S. market and Nandrolone may look a whole lot better. By understanding the functions and traits of Durabolin, the therapeutic advantages largely speak for themselves. Then we’re left with performance enhancement, which is the primary point of interest for most men, and by far a representation of the steroid’s primary use. In order to understand the effects of Durabolin, we must first recognize that there are numerous purposes to performance based supplementation. It’s very common to assume the entire point of use is building large amounts of lean tissue, and that is a primary point of use, but it’s also far from the only one. There will be those who supplement with Durabolin with no gains in lean mass in mind; in fact, this type of use is not all that uncommon. However, this does not take away from this steroid’s ability to build lean tissue, which is its primary purpose. For the off-season individual looking to build or add large amounts of lean mass, Durabolin is an excellent steroid to choose. While it will be much faster acting than Deca Durabolin, the overall gains will still come slower compared to many steroids, but the quality will be just that, quality. Water retention is possible, but should be extremely easy to control for most men. Significant and substantial amounts of lean tissue should be obtainable with this steroid, but it will only occur with enough calories in your diet. You must consume enough calories to support growth, and this will normally only require a few hundred calories per day above maintenance. Of course, some will need even more based on their genetics. Due to this necessary caloric surplus, this will typically promote body fat gain during the off-season, it’s inevitable, but the use of Durabolin should limit it. Nandrolone has been shown to have a very strong metabolic enhancing effect. Then we have the relief and recovery effects of Durabolin, and as off-season training is normally accompanied by very heavy weight training, this will be more than welcomed. As bulking is a primary purpose of use, many rarely think of Durabolin as part of a cutting cycle, but it can serve a purpose. This steroid will greatly protect lean muscle mass during a necessary caloric restriction. Remember, to lose body fat you must burn more calories than you consume, and this can lead to lean tissue loss. Durabolin supplementation will prevent this. During the dieting phase, many also choose to use Nandrolone for the recovery, endurance and relief it can provide. Undeniably hard dieting can take a toll on the body, making low dose supplementation during this phase extremely beneficial. The final point of use that sums up the effects of Durabolin is direct athletic enhancement. Nandrolone does have the ability to increase strength, but it’s not what we’d consider a premier strength increasing steroid. Where this steroid shines in athletics is once again in its promotion or enhancement of muscular endurance, recovery and relief. The wear and tear produced by competitive sports is extremely taxing on the body, making Durabolin a perfect solution for the athlete to ensure his performance is at its peak the duration of a season. So effective for relief and recovery, Durabolin actually promotes true relief and recovery. This is not a masking or false effect that is obtained through painkillers or traditional medicines but rather true recovery and relief. Durabolin is one of the more well-tolerated anabolic steroids on the market, especially for adult men, but can serve a purpose for females. Females are, however, normally advised against performance based use with this steroid in lieu of better options. For most men, while side effects of Durabolin use are possible, they will largely fall into the possible category and not guaranteed; there is an exception. But most men will find with responsible use this steroid can be extremely beneficial without unwanted problematic effects. In order to understand the side effects of Durabolin, we have separated them into their specific categories with all the related information you’ll need. Durabolin does carry with it a mild amount of estrogenic activity due to a slight aromatizing nature. Aromatization refers to the conversion of testosterone to estrogen, and as excess estrogen abounds it can lead to gynecomastia, excess water retention and high blood pressure due to severe water retention. The total amount of aromatase activity in Durabolin is approximately 20% the rate of testosterone promoting favorable control, but it’s still enough to induce possible problems. However, the Nandrolone hormone also has a strong binding affinity for the progesterone receptor, as well as the ability to significantly stimulate the estrogenic mechanism in the mammary tissue. This factor along with slight aromatization will increase the risk of gynecomastia. To protect yourself from the estrogenic side effects of Durabolin many men will need an anti-estrogen medication. The primary choices are Selective Estrogen Receptor Modulators (SERM’s) like Nolvadex (Tamoxifen Citrate) and Aromatase Inhibitors (AI’s) like Arimidex (Anastrozole). AI’s will be the most effective, but they will also have a negative effect on cholesterol. This negative effect can be exasperated when anabolic steroids are present. SERM’s are often enough and fortunately will have no negative impact on cholesterol levels; in fact, they should improve your cholesterol. However, the total dosing of Nandrolone and individual sensitivity will dictate quite a bit, some men will necessarily need an AI, but SERM’s should be chosen first if they can get the job done. As with Deca Durabolin and all 19-nor compounds, it’s long been assumed and passed around that prolactin was the concern regarding gynecomastia and the use of 19-nor anabolic steroids. This is, however, not the case, but rather dependent on the balance between estrogen and progesterone. It is the imbalance that leads to gynecomastia, not prolactin. Durabolin carries a rather high threshold when it comes to androgenic side effects. Such effects are possible but they are unlikely in most men. Possible androgenic side effects include acne, accelerated hair loss in those predisposed to male pattern baldness and body hair growth. These effects will largely be dependent on genetic predispositions and should not be enhanced by the hormone’s interaction with the 5-alpha reductase enzyme. Like testosterone, Nandrolone is metabolized by the 5-alpha reductase enzyme, but it reduces it to DNH, not DHT reducing relative androgenicity. As with all Nandrolone compounds the use of 5-alpha reductase inhibitors like Finasteride is highly cautioned against when using Durabolin. While such inhibitors will protect against the androgenic side effects caused by testosterone, they will enhance the androgenic activity of Nandrolone. It is also the androgenic nature of Durabolin that is responsible for virilization symptoms in women. While only mildly androgenic, there is enough translating action to promote symptoms. Common virilization symptoms include body hair growth, a deepening of the vocal chords and clitoral enlargement. It is possible for a woman to use Durabolin without virilization symptoms, and most will find Durabolin easier to control in this regard compared to Deca Durabolin. However, low doses will be the key along with very short-term use. The issue of individual response will also play a massive role. Regardless, there are better steroids for performance female athletes to choose. If Durabolin is used and virilization symptoms begin to show for any reason, discontinue use immediately at their onset and they will fade away. If the symptoms are ignored, they may become irreversible. Durabolin can have a negative effect on cholesterol, especially HDL suppression. The potential negative effect on cholesterol caused by Nandrolone is slightly greater than testosterone. The same negative effect will also be enhanced and could potentially greatly skew your HDL and LDL levels when conjoined with the use of an AI. Due to the possible cholesterol issues, maintaining a healthy diet that is cholesterol friendly and rich in omega fatty acids is highly important. Including plenty of cardiovascular activity is also advised. It will be important that you keep a close eye on your cholesterol during and after use. This is by no means the unfriendliest anabolic steroid to cholesterol, most oral steroids are far more potentially damaging, but keeping an eye on your levels is part of responsible supplementation. Of the possible side effects of Durabolin, there is only one that is absolutely guaranteed in all men who use it, natural testosterone suppression. This is a trait shared by all anabolic steroids, and while the rate of suppression can vary greatly depending on the steroid in question, with Nandrolone it will be very strong. Genetics, diet, and any stories you may have heard will not change this. If you supplement with the Nandrolone hormone you will greatly suppress your natural testosterone production. Some data has shown a single 100mg injection to suppress all production. Other studies have shown low dose use to suppress as much as 2/3rd total serum levels. In either case, both represent a low testosterone condition. Due to the strong rate of suppression, those who use Durabolin (excluding females) should always include exogenous testosterone. This will ensure your body has the testosterone it needs, avoids the numerous possible low testosterone symptoms and greatly protect your health. Many will also find Nandrolone works very well with testosterone during periods of off-season growth. Once all Durabolin is discontinued along with all anabolic steroids, natural testosterone production will begin again. During this time it is advised that the individual implement a Post Cycle Therapy (PCT) plan in order to speed up the process. A PCT plan will often include SERM’s like Clomid and Nolvadex as well as HCG. The PCT plan will not return your natural levels back to normal but it will stimulate natural production and ensure you have enough testosterone for proper bodily function while your levels continue to naturally rise. Important notes on natural testosterone recovery post Durabolin use. Natural testosterone recovery assumes no severe damage was done to the Hypothalamic-Pituitary-Testicular-Axis (HPTA) due to improper use. Natural recovery also assumes there was no prior low testosterone condition prior to Durabolin or anabolic steroid use. Durabolin is not toxic to the liver and will present no stress of damage to the organ. Durabolin is a faster acting Nandrolone compound than Deca Durabolin and will require more frequent injections. The compound is rarely used for medicinal purposes; the Decanoate version is normally preferred for this purpose. If used medicinally, standard Durabolin doses will normally fall in the 50-100mg per week range for both men and women. However, women will rarely be prescribed more than 50mg per week. For the purpose of performance enhancement, 100mg per week will provide some nice therapeutic relief, but most men will find 200mg per week to be the low end dose. 200mg per week will improve recovery, ease joint pain and provide a moderate anabolic boost. Most men will find they can tolerate 300-400mg per week very well. Such doses are very common for the purpose of building lean muscle mass. More can be used, but this will increase the risk of adverse effects. Regardless of the dose, the total dosing should be split into a minimum of two injections per week. Three injections per week will prove to be very efficient with some choosing an every other day injection schedule, especially when supplementing with higher doses. The total duration of use will normally fall in the 8-12 week range. Women who use Durabolin for the purpose of performance enhancement will find 50mg per week administered in one injection to be as far as they will want to take it. Total use will normally fall in the 4-6 week range and should not surpass 6 weeks if virilization is to be avoided. Many women will find choosing steroids with even less androgenic activity to be the best way to go, such as steroids like Anavar and Primobolan Depot. Durabolin is not available on the U.S. pharmaceutical market and can only be found on select pharmaceutical markets around the world. The Durabolin brand is not too difficult to find on the black market, counterfeits are rare but most Nandrolone Phenylpropionate will be found under other trade names. Numerous underground labs have begun to carry Nandrolone Phenylpropionate, but often at a significantly higher price than Nandrolone Decanoate. Geneza Pharmaceuticals, QD Labs and Biomex Labs are common suppliers of this steroid. Increasingly common is Alpha Pharma’s version of the compound NandroRapid, which appears to be one of the better brands on the market. If this is a steroid you’d like to use, you’ll find the easiest way to obtain it is to buy Durabolin online. There are numerous online steroid suppliers available, and most carry fairly reasonable rates; however, there are risks associated with such a purchase. When you buy Durabolin online, as with any anabolic steroid you are taking a risk regarding the quality and purity of the product. You are also taking a risk as it pertains to legality, as such a purchase is illegal in many countries. The law pertaining to anabolic steroids can very greatly from one country to the next. The U.S. carries some of the strictest laws around, and while many countries are far more lenient, most frown heavily on online purchasing. For those who violate this law in the U.S., they will be violating federal law enacted under the Steroid Control Act of 1990, which officially classifies anabolic androgenic steroids as Schedule III controlled substances. The Steroid Control Act of 2004 later enhanced this same legislation. In order to legally purchase and possess anabolic steroids in the U.S. you must have a prescription, and it will only be granted on the basis of approved medical need. Due to the strict steroid laws carried by many countries, if you are looking for high quality anabolics you are encouraged to see the sponsors here at Steroid.com. The sponsors at Steroid.com carry high quality anabolics that can be legally purchased without a prescription. More importantly, such a purchase can be made within the safety of the law. You will not subject yourself to any legal risk when making such a purchase. Durabolin is without question one of the more beneficial and well-tolerated anabolic steroids to ever be made. While it’s use is very limited in a medicinal capacity, this is not due to it carrying a level of inferiority, but rather the medicinal market has been dominated by the Decanoate version. There simply isn’t a need for both compounds in any regularity. For the performance athlete, this is one of the best anabolic steroids they can ever choose as it comes with a host of advantages and benefits. Further, while Nandrolone based side effects are generally easy to control with most Nandrolone compounds, many find this ease in control is enhanced when using faster acting Durabolin. This will hold very true with female use, but can hold true with men as well.